iOS 10 features a number of updates, some big but most not so much. A few thoughts on the new features first. The first noticeable change is to the lock screen. Raise to wake on iPhones changes the reliance on the home button. It means you can see notifications or interact with widgets with ease. There’s also a lot more information on the lock screen than before which I like. It also relies on swiping which may infuriate some people as features seem lost now – where’s the camera shortcut from before? No icon instead swipe to the right pane to access camera. Today view is better as well, and widgets seem far stronger from app developers. Hue and Dark Sky are just two app’s that take great advantage of the Today view allowing me to see information far more quickly than I could in the past. Control centre now has three screens/cards instead of one. Control, Music and Home. All makes sense and combining Raise to wake and accessing control centre makes Hue light control so simple. One weird button on Control screen – Night shift. Does it really need that massive button? Also nice to see 3D touch to alter settings like torch brightness, bulb brightness and camera options. Siri supports third party app’s but hard to see much other improvement. Still lags to Google and Amazon. Photo’s seems a bit broken. A couple of nice new features around creating video’s based on location, photo’s and it does a good job. However machine learning has now been added (surely just enhanced and not added) but it does this per device. So I’ve got 7,500 photo’s scanned on the iPhone but the iPad has only 6,000 photo’s scanned asking me to plug in and switch of the device to resume scanning. Seemingly when all devices have finished scanning a comparison is done via iCloud but this approach seems bonkers compared with Google. The intelligent searching, so asking for photo’s of tree’s, summer, dog’s etc, isn’t as good as Google’s. Apple made some big claims about computation on the devices as compared to computations on a cloud service but Google wins this pretty easily. Third party dev’s can now take photo’s in RAW format which is impressive. Lightroom and a few other app’s have updated to allow this and it does help with editing. Maps – still worse than Google Maps. Music has seen a big UI change. Bold fonts, simplifying options and I prefer the new look. Makes getting to my music more easy. Playlist creation still sluggish, or is that just me? News – similar UI change to Music. Nice. Home – an app specifically for HomeKit applications. My only devices that support it are the Hue lights and they work really well with Home. A great update over previous iOS versions. iMessage is now a platform. Massive emoji support, animations, effects, gif’s and it’s own app store mostly for stickers. I like it. Upgrading to iOS 10 on my iPhone 6 was a pain. I use encrypted backups which helped but after upgrading my stored music had gone, my app’s aren’t installed so you have to wait a couple of hours for them to download and on day one the Apple server’s can’t really cope with demand so you get iCloud errors. Not the great user experience that it should be. There’s some other small features elsewhere but overall a solid if unspectacular update. Performance on my iPad Air is a bit sluggish but other devices are all working fine. It is so fast. App’s launch quickly, web pages render without issue. I’m still loving the speed increases after a number of days and considering the iPhone is my most used device this makes for a great reason to upgrade on it’s own. Screen is slightly better than the 6 to my eye. The reviews talk endlessly about why it’s the best screen yet but it feels like diminishing returns with the current screen technology. Next year finally a move to OLED for Apple? Crucially the battery is lasting longer than the 6 for me with everything running as it was before and my extra usage with the new device. The camera is great. OIS (Optical Image Stabilisation) is so good on video’s. The first video I took to show my Hue lights working for a friend was so good compared to what I could shoot on the iPhone 6. The pictures out of the 7 are also getting closer to some really high end camera’s. I didn’t go for a plus as I find the size just too big (I have a plus as a work device) but the dual camera support on the 7 looks to be great as well. Removing the headphone jack. So in the grand scheme of things it’s not that big a deal I guess and Apple did include an adapter in the box so you won’t be stuck with £1000 headphones that no longer work. People will lose the adapter though and bluetooth isn’t as reliable or as good (yet) as a wired connection. I’ve held off upgrading my headphones for the last year as I expected this was coming so some form of wireless headphones will be bought soon…not sold on the Airpods though so who knows what I will pick up. The home button is no more. It’s a pretend button with your brain tricked by the Taptic engine that a button has been clicked. Does it work? Sometimes. I’m mostly used to it although it does feel weird switching between 7 and 6S, from Taptic button to real button. There are times though that it feels like the whole bottom of the iPhone is clicking, not just the button. Use of Taptic engine through the rest of the O/S though is great. Neat little touches as you resize an image, scroll through a list are much improved thanks to the new engine and iOS 10. An unexpected win. 3D touch is much improved compared to the iPhone 6S. Much better feeling and used in many more places. Another win. The video above was from St Rules tower in St Andrews on a pretty windy day and apart from me taking the video in portrait I thought the OIS did a really good job of keeping things stable. 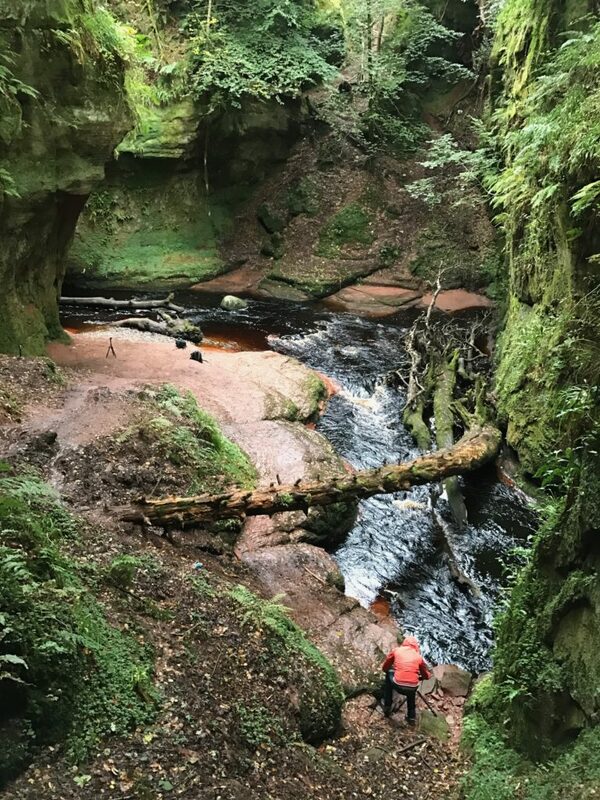 On Monday I took a trip to Finnich Glen and despite some challenging conditions the iPhone performed really well. Overall I’m delighted with the iPhone 7. Fast, great camera and the haptic and 3D touch improvements are unexpectedly good. Shout out too for the Apple leather case which is a step up on previous versions. Metal buttons make all the difference. The Apple Watch has been out for around 18 months and the biggest step change is watchOS 3. It’s made my watch actually usable for third party apps and killed some of the other features like it’s focus on messaging to provide a dock which contains frequently accessed app’s. The change in day to day use is pretty startling. I can now access weather and news without waiting for 30 seconds while it refreshed. Activity stats are also readily to hand and messages is still there but as an app alongside the others not in its own unique place. It’s also easier to swap watch faces so you can have one setup for work, one for activity, one for travelling. Along with the easy switching there’s a couple of new faces. One focussed on activity and one which is Numerals and a very simple display. Extra customisation with regards complications and third party watch faces are clearly for a future watchOS version. The upgrade wasn’t without issue though. The first few days it felt like the display would take slightly longer to switch on. I also had a lot of hassle with third party complications but it looks like they were all third party developer issues as subsequent app updates have resolved all the issues. Overall watchOS 3 is a great update. Apple also launched Apple Watch Series 2. It’s interesting to see Apple focus on sport and activity over timepiece and luxury which the first editions were all about. The new watches have far brighter displays, are now water resistant to 50 metres and now have a dual core processor which is twice as fast as the previous watch. While important upgrades the biggest for me is built in GPS. This means a run or walk no longer needs the iPhone to track it accurately. If I was running right now it would be an instant purchase but for now I’ll stick with my current watch. Apple iPhone 7 and the Apple Watch Series 2 are great devices. iOS 10 is a strong mature platform and watchOS 3 proves that Apple isn’t scared to rip it up and start again. The reimagining of the device thanks to watchOS 3 is fantastic. However it’s clear that exploding batteries aside, Samsung have caught up and in many ways overtaken Apple from a design perspective and pushing new technologies out to consumers. Apple really have to pull out the stops for next years iPhone or risk seeing more people shift to Samsung and Android. It also needs to up it’s gain with regards Siri as it looks tired when compared to it’s competitors. I also wonder if next year is when Apple shows it’s AR hand? 2017 feels like a year when Apple needs to knock it out of the park. Can it? Same kinda experience here. Biggest ‘surprise’ win is the Taptic Engine in the phone. Smallest irritation is the occasional random restart of my Watch. I just posted today on headphone issues I get, basically bluetooth headphones aren’t great if you keep your phone in your pocket. I use mine at work, with the phone on the desk, and no connection issues at all, can even walk across the office and back. But heading home, phone in pocket… dropout stuttering.. 🙁 Not an issue with the phone (this hasn’t changed, I had it on the 6 as well) but a royal PITA! I’ve seen a couple of random restarts as well, but not as many as Sierra has caused. But thats a whole other post. That my worry with any bluetooth headphones. Not end of the world, but really frustrating when you get dropouts.